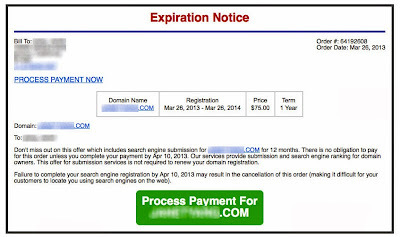 Domain Registry of America and similar companies have been mailing letters to domain name owners attempting to trick them into switching from their existing registrar to theirs, under the pretense that the customer is simply renewing their subscription to their current registrar in a scheme known as domain name slamming. They have been doing this for several years, and by now most of us have learned to toss those letters in the trash immediately. 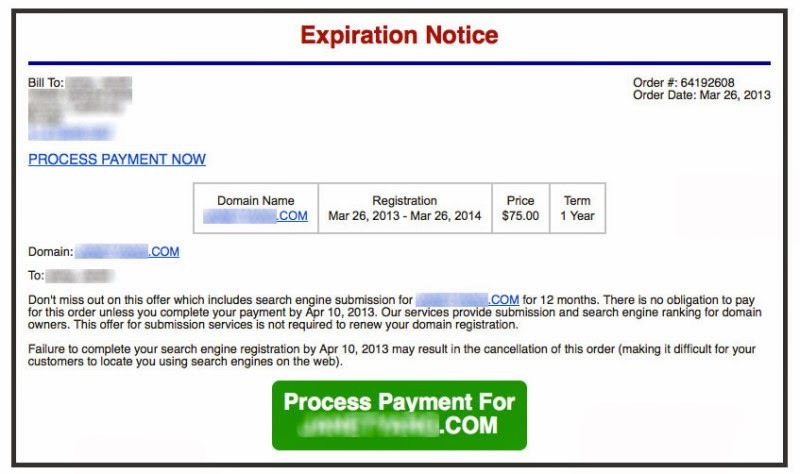 Now there is an e-mail scam making the rounds that attempts to separate you from $75 of you hard earned money by wrapping a worthless "search engine submission service" inside what looks like an expiration notice for your domain name. If you are not sure about any communication you receive regarding your domain name, forward the information to me or give me a call, and I will help you determine if it is legitimate.